I did some searched and scoured around and could not find a thread dedicated to HSU subs so I figured I would start one. Just purchased a VTF3 MK3 on Thursday and it should be arriving this Thursday. I can't wait. Would love to hear from other owners there experiences good or bad. my experience with HSU was fantastic. They answered all my questions, made a recommendation without over or underselling me and even worked on the pricing with me. It was by far the best I have ever been treated by a HT vender. I've never owned a subwoofer before. I can't wait until thursday. I will post my thoughts after it arrives and I calibrate everything. Cool idea. There are lots of individual threads about Hsu subs so it's nice to have one spot to check first. I should be getting my VTF3-MK2 on Friday. I bummed though. I'm still constructing the HT so I nothing is set up yet. I'm dying to hear this stuff! Gotta have some great lows to complement our awesome mids and highs! Soon as I get mine setup Thursday I'll let you know how it goes. I got a VTF3.3 also. It is an amazing sub. I had recently purchased a Klipsch Synergy sub 10 200w from Best buy, which was a step from my polk. The klipsch was 400.00 full retail. The HSu was 700.00 but way more capable and quite the sub for in my mind not that much more in price for what one could pay to get this quality. I have a 18x13x8 room and I have it only at like 1/3 the way up in volume which is still like 5db above the rest of my speakers and it disappears so well into the soundstage with music and movies. At the same time it rocks and is very powerful. If I really crank it my house will shake considerably. The low sounds it plays are incredible. I was watching a Chick Corea special on HDnet the other nite. It was a 30th anniversary tribute to him and he was in a piano duet. My sub was picking up and resonating the low notes so beautifully. I love it. Great piece of Audio hardware. Try King Kong to really get a feel of what it can do in a movie. NOTICE: THIS IS TO BE A SUPPORT THREAD FOR OWNERS OF CURRENT HSU PRODUCTS THAT REQUIRE SUPPORT HELP. WE WOULD NOT CARE TO SEE THIS THREAD REMOVED BASED ON THE ACTIONS OF SOME AS IT IS NOT TO BE USED TO AS A MARKETING AREA OR WHAT HAVE YOU. WE DO NOT CARE TO SEE THIS GET OUT OF CONTROL. FAIR WARNING. Are we allowed to talk about our opinions on the sound from HSU products? I started the thread in hopes that it can be used to discuss user experiences as well as support questions, placement, etc for HSU hence the "owners/support." I just want to make sure that people can give there impressions of HSU products they purchase as well as ask support questions regarding them. I agree that this thread stays away from talking about any other products or bashing of any kind. I just want to create a home for HSU owners to talk about HSU products. Just want to clarify. Thanks. I think this thread has a good start so far. To those using nearfield placement with HSU subs. What are your impressions. HSU recommends often to use nearfield placement directly behind the listening position or next to it. I am planning to give this a try when my sub arrives tommorrow since I live in the upper of a duplex and this should let me keep the volume lower and still feel it. Anyone else using nearfield placement instead of cornerloading it? 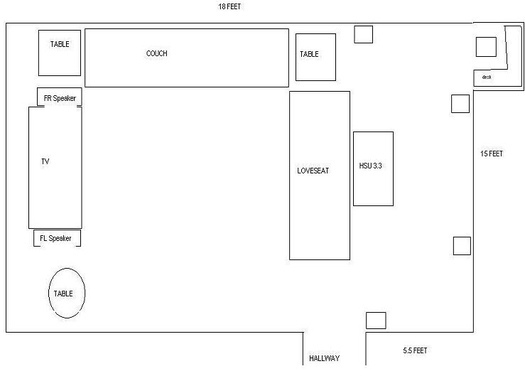 I plan on nearfield placement also, have hardwood floors so am thinking of a Auralex Gramma pad for the subs placement. I was part of the great HO preorder drama. I had the HO nearfield in the begining. I did not have an SMS-1 yet but even with an SPL meter could see that I had some pretty large nulls when running the sweep. I finally moved the HO to the front right (the only corner) and got a lot smoother (flatter) response but I did loose a little of the impact that I felt having the sub nearby. If the room allows I think nearfield is a good solution. I went another way and got the MBM12 and that brought a lot of the impact bact and I am very pleased. I do have a question for other owners. I am using the SMS-1 which has no time delay settings so have decide to set the reciever distance for the sub-out to a distance some where in between. I was wondering what others were doing and if anyone had found the time delay to be a problem? FYI...you'll really need a Great Gramma if you are using a VTF 3.3. At 15" x 23", the Gramma is just a little too small. I was also part of the great HO preorder drama...I ended up with 2 VTF-3HOs plus Turbos...I want the MBM-12, but in my apartment I am not sure if that is really what I need...I am getting married at the ripe old age of 58, and may be buying a house...I have a mix of equipment with classic JBL L60T mains, centers from Boston and Klipsch, surrounds from Cambridge Sound works connected to an ADC passive subwoofer...my current Kenwood receiver is about to be replaced by a Denon 5803A...and I went with a different subwoofer for my bedroom. Without further discussion on why David posted that, I think it was my post. I more than admit I get a bit zealous over some things and I would probably make a good salesperson for somethings that I really love and believe in. Unfortunately I DO NOT get paid for such fervent support of any items I own. Let's leave it at that and I can see why after reading my own post it would be an issue. My VTF-3 MK3 arrived today. I got it hooked up and ran the audyssey eq setup again on my denon 2807. It set the LFE level to -12. I changed this to -5 from what I have heard from others. I have the level on the subwoofer set to 3/4 of full which seems kind of high from what others have talked about. I have polarity set to 180 since that sounds better. Crossover is set to out since I am crossing over all 7 of my klipsch speakers to 80hz and my subwoofer crossover is set to 80hz. The sub is working. It just isn't nearly as impactful as I was thinking it would be from hearing others. 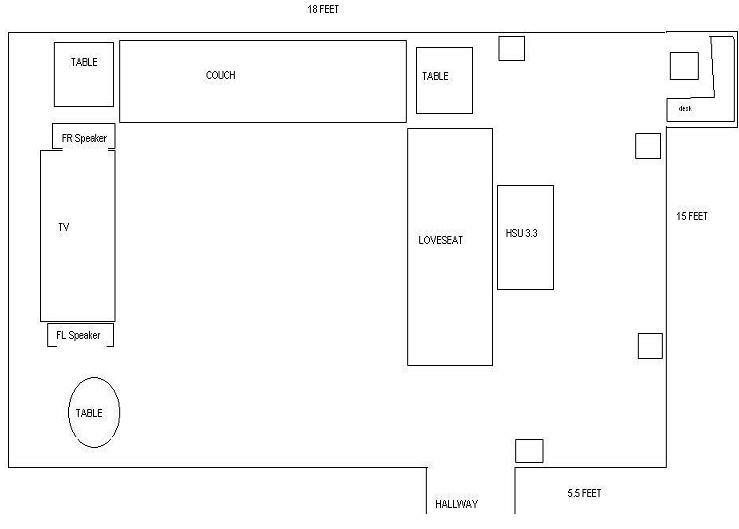 I have attached a schematic of my room. Am i getting the correct amount of bang with my reciever at -5 level and sub at 3/4ths volume in this size of room? I'm kind of worried what this sub would sound like in a larger room when I move to a larger place. This room is only 18x15 I was kind of expecting this thing to shake the whole place wildly at these levels and it just doesn't. I mean I can feel umph and boom from behind me on the loveseat but nothing like the levels I've heard described. From what I've read this thing should shake the whole place wildly even at half volume on the subwoofer. You should be getting a HUGE amount of bass with the sub's gain at 3/4, especially with the sub directly behind you. It should be more than you can handle at -5 on the receiver at even 1/4 or so. Are the speakers set to SMALL or LARGE? Audyssey may have set them to Large, which would mean that they are playing the bass rather than the sub. Set all speakers to Small. Do you have or have access to an SPL meter? You should try setting the sub and speaker levels manually. Also, you can use the SPL meter to check the frequency response with Avia (Netflix even has it). Run Avia's sweep tones to see how flat or bumpy your frequency response is. The flatter the better. There could be several very large peaks that throw off the calibration level, so all the other bass is much much quieter. You may find that placing the sub in the front right corner yields smoother response, if you can experiment some. I have a relatively small room (maybe 12'x15'x8'). I'm looking at the VTF3MK2 and the VTF2MK3. I dont' get all the technical stuff about subs but on the surface it appears they are nearly identical except for the VTF3MK2 has more power. At only $60 more, is there a reason I wouldn't want the more powerful sub. Is it bad to have a more powerful sub and not push it as hard? Even though it is only $60 more, I'm leaning towards the cheaper, less powerful VTF2MK3 since the other seems like over kill for my room. Anyone have any good reason to sway towards one or the other? You need to get a spl meter and calibrate your sub to your other speakers. Even if you do not have a test disc you can use the pink noise from the receiver. In my opinion having the gain set to 3/4 is way to high. Start with the dial at 9 o'clock and start going from there. I have a VTF2.3 in a small room 12X13 the gain on the sub is at 9 and the receiver at -7. This is just to give you an idea not to tell you where your will need to set yours. The extra power gives you a little more headroom. Comparing them side-by-side, you'd most likely only notice a difference between the two at high volume during demanding movie scenes. Even then you may not notice a difference, or only be able to measure (with a meter) a few dB difference in max output. My advice would be to go with the cheaper one and add a BFD ($100) to eq the sub. I have an SPL meter. I went to level configuration and all 7 speakers are equal at 83Db on test tones. The Subwoofer is at 92 Db @ -5 level and 3/4ths of the volume on the sub itself. Does this sound about right? Am I not getting the power from the amp that I should be getting? Did you read my post, number 16 up above? I did use avia and calibrated it but like I said I need 3/4ths on the volume of the sub and -5 on the reviever to get 92db during test tones. I have all speakers set to small. I'll have to check the manual but I don't believe I've ever touched anything with midnight mode. Even on music if I go direct mode from a coax cable from my pc sound card(xfi) the base is not loud at all unless I crank it up to max volume on the sub. However movies play louder base just not anywhere near what I THINK it should be at 3/4ths volume on the sub and -5 on reciever especially in this small room. Can you take a picture of the back of the sub to show what your settings are? My next suggestion would be to run the sweep tones, mainly the left, right and LFE, and see how flat or bumpy the response is. You can experiment with the 0/180 phase setting using these tones as well, because with the left/right sweeps you may notice drastic differences in the response around the crossover. Still, I think you should try the sub in the front right corner and see how it performs. Does this "direct" mode use your receiver's bass management? Often times direct mode in the receiver bypasses signal processing and only outputs to the left/right mains. I'll have to check the manual but I don't believe I've ever touched anything with midnight mode. It may be on by default on certain equipment (like DVD players). If all else fails, contact Hsu. There could very well be a problem with your sub, the driver or the amp or something. I am a happy HSU customer as well. I am loving my HO + MBM. Still playing around with levels and locations though. Your settings do seem a little out of whack. I would definitely try moving the sub to a different location just to see if anything changes. LFE is for HT only so for the sub to work with music you need to set your speakers to small. Do you have access to another sub so you can be sure the reciever is not the problem. I will say that I have an HO and MBM12 and when I go to my neighbors his cheaper sub sounds louder (boomy), a higher end sub gives a far more even response. I think the sub may just be setting in a bad spot in the room though. If all else fails call HSU they are very helpful. Just make sure they send you a power cord! My VTF-3.3 didn't come with one. Though, from what I've read about the thin 'n' wimpy cord they give you I might just shell out just a little more for a somewhat thicker gauge third-party IEC cord since the rated power draw is pretty high. At least customer service is sending out another one. I'm coming from an SVS passive cylinder with Samson amp. I placed the HSU on my previous Subdude platform and it just fit. Whew! Another thing to check is to make sure that the crossover knob on the sub is turned all the way to the max. Your sub should put out a lot of bass at 3/4 on the volume knob. I have my sub set at around 10:00 o'clock position on the knob and it is way plenty of bass for me. its set to max but should not matter since I have crossover set to out which disables it on sub. Without further discussion on why David posted that, I think it was my post. I more than admit I get a bit zelous over some things and I would probably make a good salesperson for somethings that I really love and believe in. See! This is why we can't have nice things!